Though to originate from the south and from present day Kenya, the Cushitic Oromo were once nomadic pastoralist and skillful warrior horsemen. Today most are sedentary making a living as farmers or cattle breeders. The Oromo are Muslim, Christian and animalist in religion and are known for their egalitarian society, which s based on Gada or age based group system. A mans life is divided in to age sets of eight years. In the forth set (between ages 24 and 32) men assume the right to govern the people. 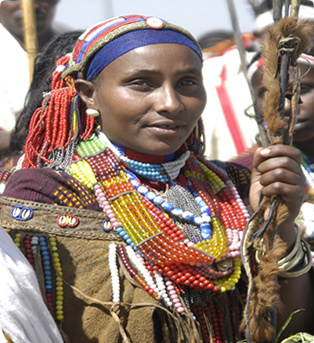 The Oromo are esteemed to form the largest ethnic group (around 45%) of the country’s population.